Holcim (US) and Lafarge North America Inc., US businesses of LafargeHolcim Ltd, One of the world’s leading suppliers of cement, aggregates, concrete and asphalt, have announced that they have selected SafeRack to be their exclusive provider of trailer loading gangways, platforms, and safety related loaded equipment for the entire US marketplace. Two months of joint diligence has resulted in a contract which will span nearly a half of a decade. This deal will enable SafeRack to supply all 100-plus locations of Lafarge North America Inc. and Holcim (US) in the US with innovative, robust, and safety-focused equipment, enhancing productivity as well as employee well-being. “SafeRack has clearly demonstrated that the combination of their superior products, can-do attitude and commitment to safety is the perfect match for us. 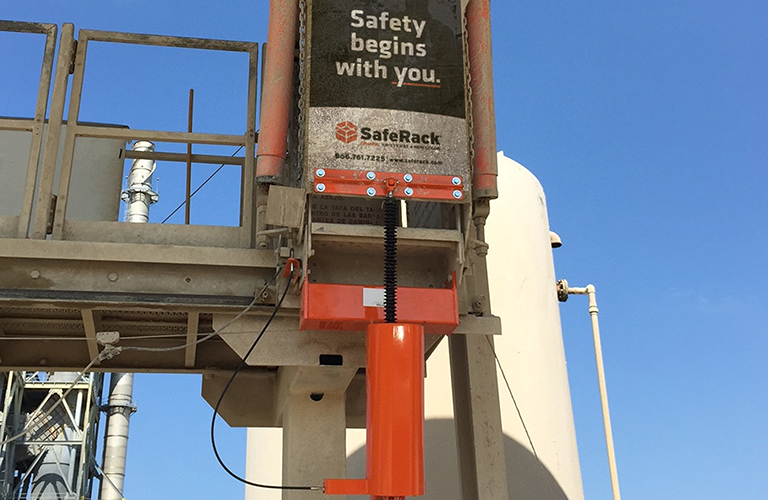 We trust SafeRack to not only respond to our equipment needs, but also help us push innovation, cost control, and enhanced plant and terminal operations across the organization. We are looking forward to building on our already great relationship to make our loading facilities safer and more aligned with our company objectives,” said Josh Halada, Transportation Safety Manager at LafargeHolcim. At the center of the deal is SafeRack’s flagship product, the G4 Series Gangway and patent pending safety lock-down device. The innovative, forward-thinking design boasts the industry’s longest service life and emphasizes enhanced operator ergonomics, both of which have helped SafeRack and its G4 Gangway set the gold standard for design, engineering and customer service. “SafeRack is thrilled to be selected as the exclusive loading gangway provider for Lafarge North America Inc. and Holcim (US),” added Jeff Reichert, President of SafeRack LLC. “We’re dedicated to building on the trust that we’ve earned with Lafarge North America Inc. and Holcim (US) over the past 5 years and will strive to exceed expectations as we move forward. This will truly be a great partnership”. SafeRack is a SixAxis LLC company based in Andrews, SC. Founded in 2003, the company manufactures industrial safety products and provides turnkey engineering, procurement and construction (EPC) services that improve worker safety and productivity in truck, railcar and industrial loading applications. SafeRack gangways and loading platforms are engineered and configured to comply with safety regulations, delivering a fall protection system that’s easy to operate and requires little maintenance. Many of the world’s leading rail and truck carriers of crude oil, aggregates, liquid natural gas, and other bulk products trust SafeRack for their unparalleled service, speed of delivery and quality product. For more information, download the SafeRack Extended Product catalog. To learn more about SafeRack loading technologies, visit the SafeRack website or call (866) 761-7225. With a well-balanced presence in 90 countries and a focus on cement, aggregates and concrete, LafargeHolcim (SIX Swiss Exchange, Euronext Paris: LHN) is the world leader in the building materials industry. The Group has 100,000 employees around the world and combined net sales of CHF 29.5 billion in 2015. LafargeHolcim is the industry benchmark in R&D and serves from the individual homebuilder to the largest and most complex project with the widest range of value-adding products, innovative services and comprehensive building solutions. With a commitment to drive sustainable solutions for better building and infrastructure and to contribute to a higher quality of life, the Group is best positioned to meet the challenges of increasing urbanization. In the United States, LafargeHolcim companies include close to 350 sites in 43 states and employ 6,000 people. Our customers rely on us to help them design and build better communities with innovative solutions that deliver structural integrity and eco-efficiency. We are committed to contributing to Building Better Cities and are an active participant in local environmental, educational and sustainable construction initiatives, including relationships with the Wildlife Habitat Council and Habitat for Humanity. Lafarge North America Inc., Holcim (US) Inc., and their subsidiaries are LafargeHolcim companies, and together constitute the largest diversified supplier of construction materials in the United States. These companies are sometimes referred to as “LafargeHolcim US” for editorial convenience. ©2019 SixAxisLLC. All Rights Reserved.